If you’re interested in resort history, maps can be a valuable resource for finding information. Early tourists relied on them not only to show how to reach a resort, but to know what amenities were offered. The maps were usually the large folding kind, not easily collected in a book, even one as big as The Early Resorts of Minnesota. That’s why readers are referred to this website, which contains over forty resort maps (and over 1,400 resort and tourism photos). An original map may have information added or removed by someone unskilled in drawing maps or lettering, possibly because the original cartographer was unavailable. Various factors affected the boundaries of resort maps, including competition from other civic organizations. As resort numbers increased, the larger map areas were broken into smaller ones as other groups claimed new boundaries and customers. Some resorts advertised in two regions, or in a distant one with a larger number of resorts. In my book, I used the boundaries of the five resort regions defined by Explore Minnesota. This kept resort numbers accurate by not listing resorts or lakes in more than one area. I have included links below to a large early Brainerd Chamber of Commerce map and resort directory for Crow Wing County and parts of Cass County. Over 260 resorts are advertised on it. It was created by Benn A. Wagner and G. H. Berkholder, and is labeled “Vacationland–Minnesota’s Land of Hiawatha.” The copyright date was probably removed in a reprinting. The map may have been originally drawn around 1925, since U.S.highway numbers are labeled for Iowa, but not for Minnesota. (U. S. highway numbers started in 1926.) However, the “Summer Resort Directory,” printed with the map, suggests a more recent date. 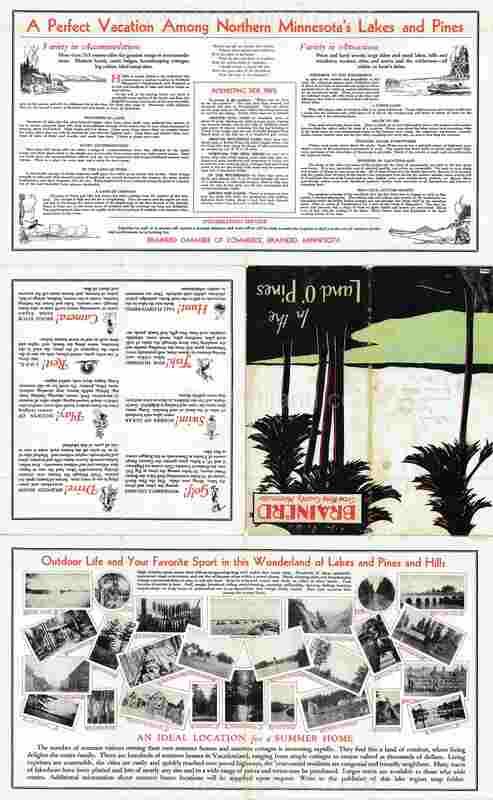 For example, we know that Arthur Roberts, whose name is in the directory, assumed full ownership of the Pine Beach Hotel on Gull Lake in 1929; and that Heath’s Resort on Whitefish Lake, also in the directory, was established in 1938, according to the resort’s website. We might therefore conclude that resorts were added to the original 1925 map for over 12 years without it being updated. 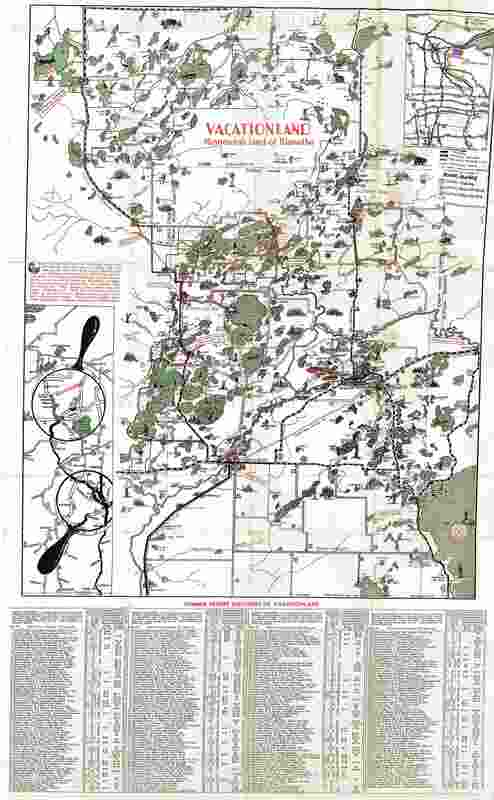 Click on these links to view the front and back of the Brainerd Lakes map. More resort maps can be found on this website’s tab “Photos and Maps” (or click here). The maps are invaluable snapshots of history. Despite occasional inconsistencies because of yearly tweaks, most are quite accurate. If you can’t find the resort you are looking for, it doesn’t mean it wasn’t operating when the map was printed, or that it didn’t exist. In some cases owners chose not to join a lake association or closed temporarily, such as my parents’ resort did during World War II. I hope this blog post helps you better enjoy the hand-drawn cartography skills that are becoming a lost craft in the technological age of MapQuest, GPS, and Google Maps.